Saturday, December 1, 2018 2–3:30 p.m.
Ages 5 to 99, advance registration required. How do animals cope with the cold? 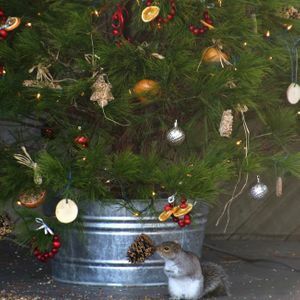 Find out with Program Director Jenny Houghton, then craft raisin icicles, cranberry wreaths, grapefruit baskets, and birdseed pinecones to feed birds and other small creatures. Hot chocolate, a reading of Night Tree, and a wintry walk to decorate the Arboretum’s wildlife tree will round out the afternoon. This class takes place outdoors. Please dress for the weather and meet on the patio at the rear of the Visitor's Center. If it rains, the program will be canceled.